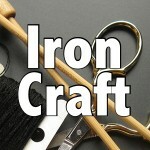 It is Iron Craft’s third anniversary, so for the challenge we were asked to make something from the traditional third anniversary gift, leather, or the modern gift, crystal. 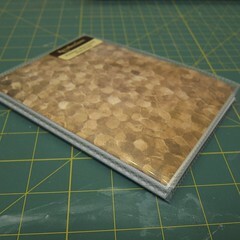 We had a little leeway with the materials in that leather could be vinyl and crystal could be glass. I decided to go the leather route, but used a heavy vinyl made for car seats. 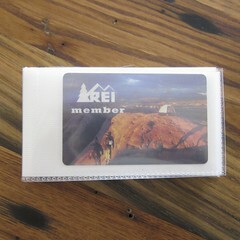 I don’t know about you, but I seem to have quite a collection of cards, rewards cards, club cards, gift cards and so on. I was carrying them all in my wallet and it was getting out of control. I was taking some out, but then never had them when I needed them. So, I decided to make a wallet just for carrying them. This took a little brainstorming and walking around the craft store to figure out what to use as the plastic slots for the cards. A cheap photo book ended up being the perfect option. It is a little wider than most cards, but for me that means I can also put things like receipts or other things I want to carry around in it without folding them up so tiny. Now all my cards are in one place and when I’m going shopping I can just throw this wallet in my purse knowing I have everything I need. 1. 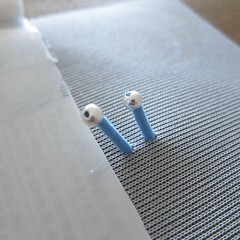 Remove any stickers from the outside of the photo book. With my book, the design on the cover was just a piece of paper in a pocket, so I removed that too. 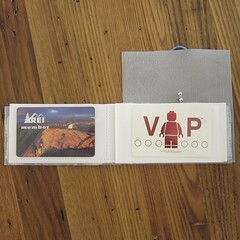 Slide a card in the photo book for size and cut the book so it is just slightly taller than a typical card size. 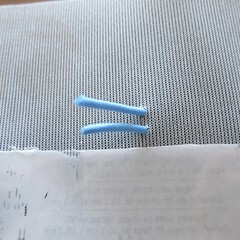 I found it was easiest to do this with a ruler and sharp exacto knife. 2. 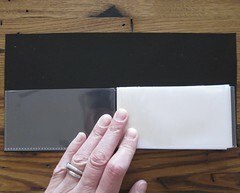 Cut a piece of leather or vinyl so it is the length of your photo book open and about twice as tall. Err to the bigger side as you can trim in later. I used a rotary cutter to cut the vinyl. 3. 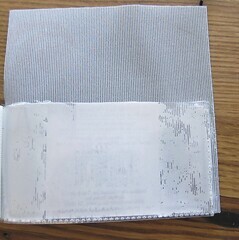 Glue the leather or vinyl to the outside of the photo book. 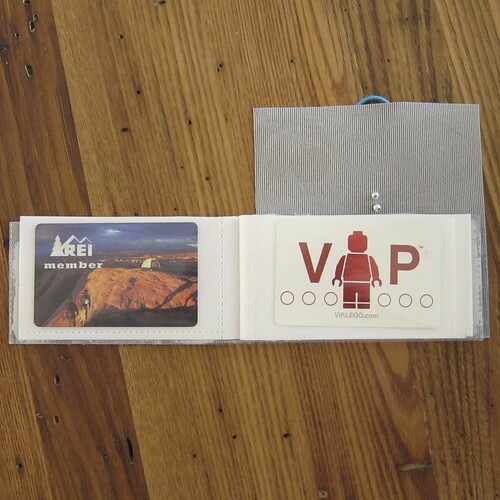 Open the book, so the slots are facing up, that is the top of the wallet. 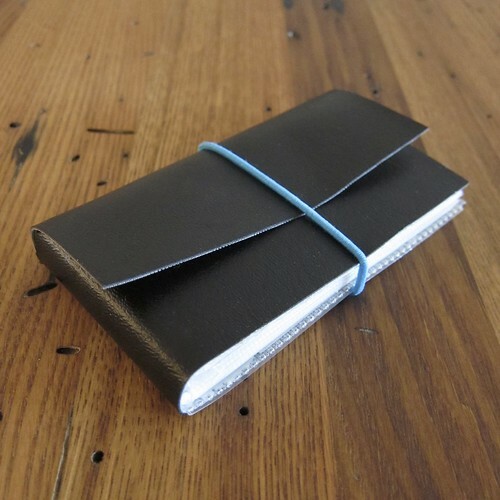 Line the bottom of the wallet up with one of the long sides of the leather. Make sure to get glue to the edges, a little paintbrush helps with this. Let dry. Trim as needed, but do not trim the vinyl off the top yet. 4. Mark the middle of the vinyl length-wise above the photo book. 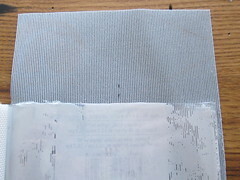 Cut down that line and then across the top over the left side of the photo book when open. 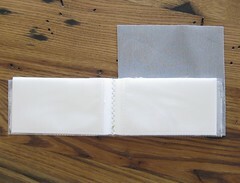 You have created the top flap and it will look like this when open. 5. 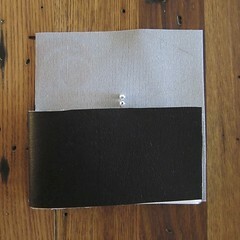 Mark the middle of the top flat about 1/4″ up from the photo book. 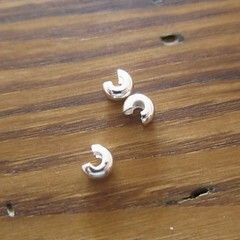 Make a second mark about 1/4″ up from that one. Use the punch to make holes at these marks. 6. 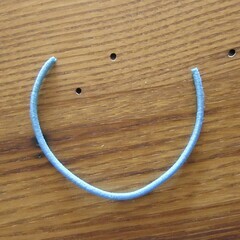 Cut the ponytail elastic open. I found there was a little space where it had been joined together, a slight indentation, and cut there. It seemed to not fray when I did that. 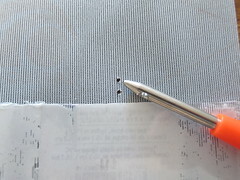 Put the ends through the holes you just made so they are on the inside of the wallet (a loop is on the outside). Put a crimper cover on each end and crimp it tightly shut with pliers. Fill the wallet with all those club, rewards, gift cards and you are ready to go. What a wonderful project. 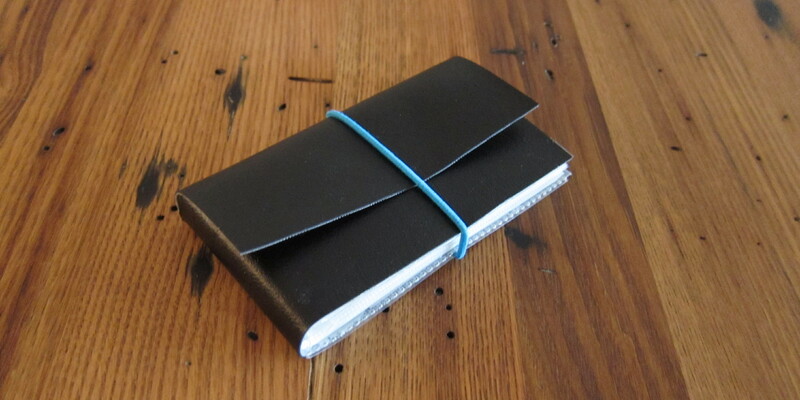 We are going to turn you into a bookbinder after all. Well done. It looks great! I love that it’s a no sew!